Recent Filming – May 2015 | Looking Up, Way Up! We’re happy to let you know about our recent filming, and to also provide some information on the status of your rewards. First, news on the filming. 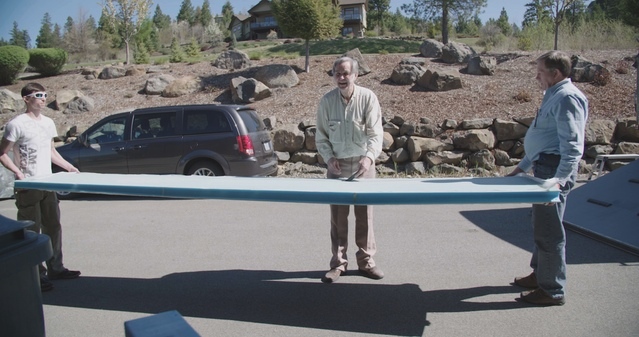 Scott B traveled recently up to Burt’s home in Coeur d’Alene, ID to capture the arrival of the wing sections, the fabrication of the skis and other rapid progress on Burt’s new plane, SkiGull. 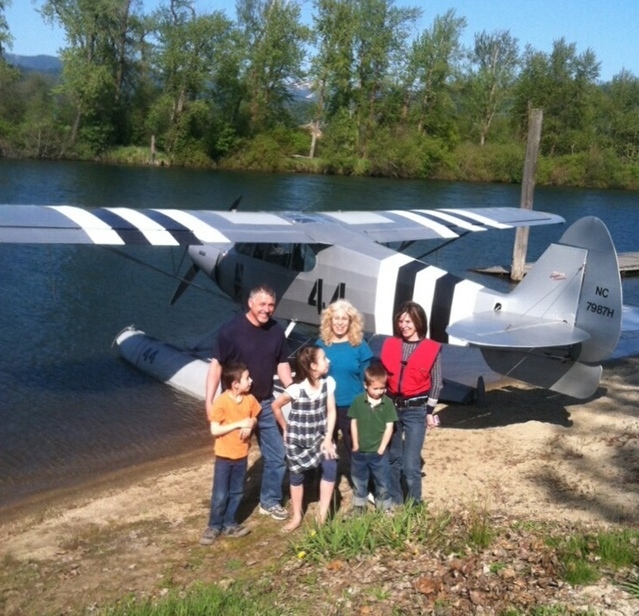 He also filmed Burt’s wife Tonya Rutan as she trains for her Pilot’s License and their Walter Mitty trip. 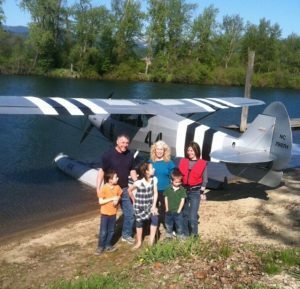 She’s going after her Single-Engine Seaplane Rating first (very unusual) and add her Land Rating later. She is already gathering fans; here’s Tonya (in the red vest) with admirers after landing on St Joe River near St Maries, ID. While Scott was in Idaho Sandy filmed Mike Melvill as he gave his talk “32 Years of Working with Burt Rutan” at the Mojave Experimental Fly-In. We caught up with Burt and Tonya here in Los Angeles when they flew down for Burt’s induction into the California Aviation Hall of Fame. He was back in the garage in Coeur d’Alene the following day before noon! Scott and Sandy are off again this week, heading to Las Vegas to interview Sir Richard Branson for the film, and then back up to Idaho to continue capturing the progress on Skiull as well as Tonya’s flight training. It’s confirmed: antennaFILMS will be at OshKosh Air Venture this year for the 40th anniversary of the VariEze. We hope to see you there! See you at OshKosh. Looking forward to another update on the film. Great to see you at our Tent Talk, Jason! I’ve been following news on Burt since the early 70’s when I was one of the 10,000 burnt by Jim Bede. As a BD5 kit purchaser I received news letters that often mentioned Burt and even introduced his Vari Viggen. I first saw Burt with Jim Bede when they lectured to The Missouri Pilots Association back about 1973. One reason I’m writing is because ,even though I have been looking, I’ve not seen anything new on the SkiGull since its first flight. I was also disappointed not to have seen Burt or SkiGull at Airventure 2016 after his wetting my appetite last year and hoping he or someone would be offering plans. Also looking forward to the film release. Is there a date set for it?